Michael is a senior videographer and editor at “Oregon Field Guide.” Since graduating the University of Oregon with a degree in science journalism and an outdoor guiding program, he’s worked in science communication for 15 years, working previously at NOAA/Oregon Sea Grant. He’s been awarded nine regional Emmy awards, America association for the advancement of science awards as well as others and worked on several national shows including NOVA PBS. He’s also worked as an outdoor guide and been trained in scientific diving, rescue diving, ice diving, wilderness first responder, swift water rescue, avalanche safety, mountaineering and others. He’s passionate about filming underwater and has logged hundreds of dives for "Oregon Field Guide." 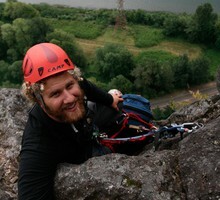 He’s equally passionate about hanging off rock walls or generally any place where the conditions are uncomfortable. Trek the backcountry of the Wallowa Mountains the old school way, with mules taking the heavy loads. There are a number of great places to go river snorkeling in Oregon. Spring is a great time to see wildflowers in the Columbia River Gorge. Here are four ideal spots to view them.